How great is this Woodplay Boxset Fairy House from Casdon? 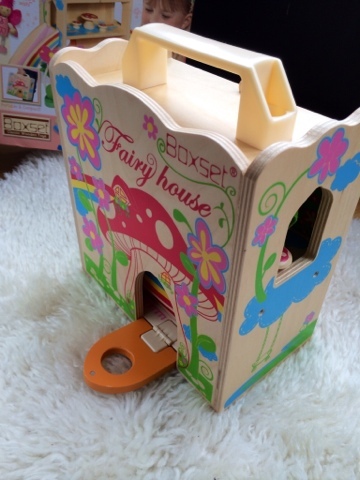 everything packs away inside the fairy house and there is a carry handle on the top making it a brilliant portable playset. All ready to play straight from the box. Everything is neatly packaged and wrapped in bubble wrap. Adorable leaf hammock for the fairies to take a nap on. 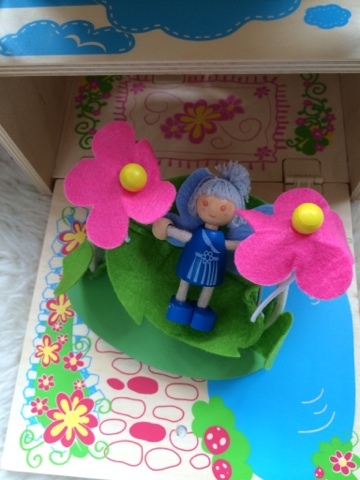 Supported by two large flowers with bendy stalks so you can position the seat to suit your fairy's needs. 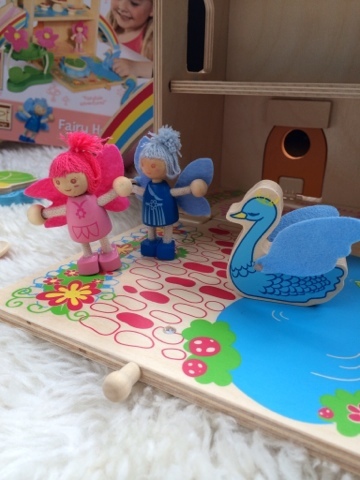 The set includes 2 fairies and a swan all with soft felt wings. The fairies both have soft hair too - and the swan wears a crown. 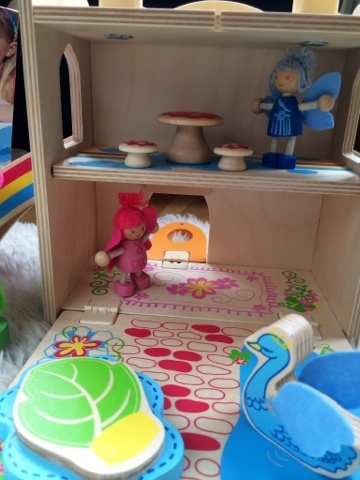 Sweet little toadstool table and 2 chairs set for your fairy picnic, and a large lily pad for the lake. The ladder simply pops on with two nobbles that fit two holes so its nice and secure too. Fairy likes to climb the ladder. Wheeeeee! Down the rainbow slide we go! Both fairies (and sometimes princess swan too!) 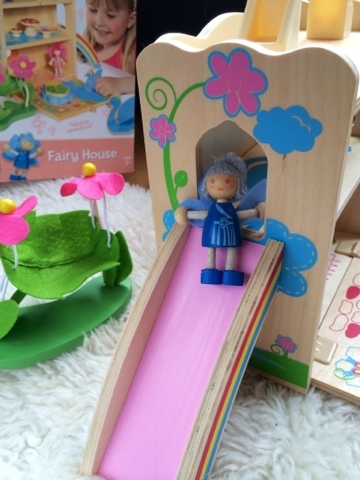 enjoy the slide, which just like the ladder, simply pops on and off with 2 nobbles. 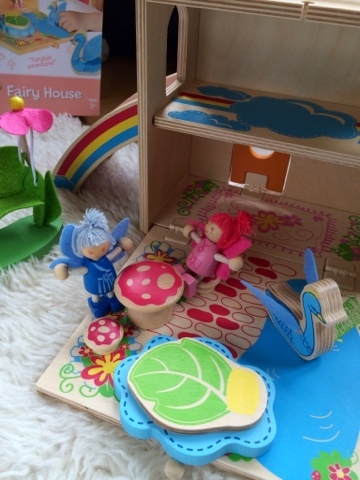 Plenty of room to play inside the fairy house, the door has a magnetic catch so it can stay closed or open out. Beautiful painted details continue inside the fairy house too. 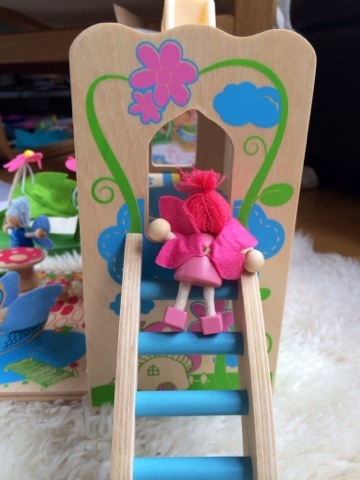 All of the parts to the playset neatly store inside and the back of the house simply closes up ad is secured by a bobble on a piece of elastic which fits into a groove. 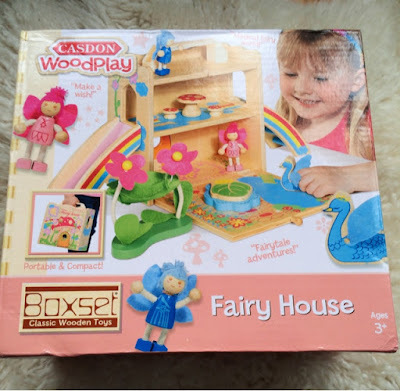 Absolutely beautifully decorated and designed, this is a great portable wooden toy and the Casdon Woodplay Boxset range includes lots of other playsets too such as a castle, beach villa and pirates! Disclaimer - I was sent the playset for the purpose of this article.